Method to stabilize the soft ground by installing well compacted stone or sand columns(piles) with large diameters through the process to repeat the driving down and extracting motion of a vibrating steel casing. The world first soil improvement method based on sand compaction pile principle, was developed and put into use by Fudo Construction Co., Ltd. 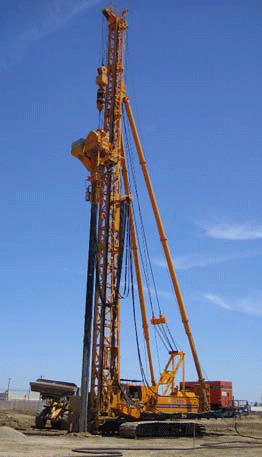 In Japan, Compozer is well known as the name of Sand Compaction Pile(SCP) method. Copyright © 2011 Fudo Construction, Inc. All rights reserved.